For those of you discouraged by a 4:32PM Sunset in Boston on Sunday, you will be glad to know that an 11-member panel, created by the Massachusetts Legislature last year, spent months examining the pros and cons of effectively establishing daylight saving time year-round and eliminating the practice of setting clocks forward and back twice every year. Their decision: move the Commonwealth into the Atlantic Time Zone (aligning ourselves with the Canadian provinces of New Brunswick, Nova Scotia, and Prince Edward Island) if all the Northeast region (including New York) agrees to change their time zone with us. This strikes me as nothing more than a hollow victory. The commission’s trouble with “going it alone” is that transportation, broadcasting schedules and sporting events could all be adversely affected. I, for one, could get used to The Tonight Show at 12:35AM, football at 2PM and early flights from Logan at 7 in the morning. It would be a challenge calibrating ourselves with the rest of the country, but I would be willing to try. But, because it is nearly impossible to buck the cultural norms, we in the Northeast will not experience a sunset after 5PM until February 4th; the groundhog may see the sun before I will during my drive home from work. Speaking of cultural norms, we were discussing the above referenced verse of scripture and my wife remarked at how difficult it is to keep the little details of this passage. If you think changing your Time Zone is counter-cultural, try not quarreling or being kind to everyone or releasing resentment. Anyone familiar with social media knows that quarreling (or fighting) is our national pastime: there are posts (and then comments about those posts) that are divisive and combative, attacking the “opposition” both personally and indiscriminately. A follower of Christ ought not engage in these senseless squabbles. If you are a driver, you know that kindness is in short supply. I realize that someone allowing me to turn into traffic is unrealistic, but I do wonder if honking the horn as the light turns green or passing on the right (through unoccupied parking spaces) on a single lane street or ignoring the ‘right lane must turn’ sign and weaving to the left at dangerous speeds are necessary. A few verses after the above passage, Paul tells Timothy that he should be gentle with those who oppose his teaching; a follower of Christ should be restrained in exercising whatever power that follower has. Life, no matter how it is lived, will contain times of deep disappointment. All but one team finishes the season without a title. Every person will find oneself in one sort of line or another, and whatever line you find yourself in, the other one is moving faster…and has fewer bitter and angry people occupying it. A follower of Christ should release resentment as soon as it is sensed. God has called us to – and equipped us for – better than our culture prescribes. No matter what time we find ourselves in, we are called to be counter-cultural: peaceable, kind and hopeful. I suspect those godly attributes will be highly regarded during the long nights ahead. Part of my responsibility as the pastor of a ‘city church’ is meeting with people on their toughest days. I am regularly greeted at the doors of the church by individuals who are in need; some needs are basic (transportation, baby formula, rent) and some are more complicated (train fare to a distant hospital, airfare to a distant funeral). So I offer some assistance. What else can I do? 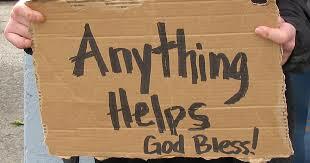 Because of the limited resources we all have, we occasionally are found reaching into our own pockets to offer some compassion hoping that we are helping those with a genuine need. Despite my rigid scrutiny, I have recently been duped by people with convincing sincerity and carefully crafted pleas. One person came asking for a loan of a few dollars, promising that when the direct-deposit was made in the morning he’d return to repay the kindness…he must have forgotten where the church is located. Another person called from a legitimate-sounding advocacy center saying that a client of theirs was in need of a public transit pass and that their funding was delayed, but certainly a voucher has been submitted to reimburse me for the expense of the assistance…pray for that legitimate-sounding advocacy center as they’ve been unfunded now for weeks. It is enough to make a person calloused to the real and present needs of the community. I want to shake my fist and dismiss anyone who comes for help. Who takes advantage of the kindness of God? Well, me. According to Doctor Luke, the Most High – God Almighty – is kind to the ungrateful and wicked. Certainly, some of those that come to the church doors with a tale of woe are among the ungrateful and the wicked. Certainly, some of those that come to the church doors and enter to worship are likewise ungrateful (and, by extension, just a bit wicked). I know that I am. To be honest, I am not perfectly appreciative of all that God allows me to enjoy. I do not delight in every sunrise or offer grace at every meal. I do not recognize every answered prayer or use every good and perfect gift appropriately. I occasionally think that I can do what I want with what I have with no regard for how I acquired it or from whom it was acquired. I, too, come to the Lord with hat in hand, promising to do whatever it takes to gain what I need, without gratitude or goodness. God showed me kindness. We all are faced with an option in life: Love your enemies, do good and lend, or don’t. When we refuse to help those around us, we may miss out on the blessing of sharing God’s grace with others who genuinely need God’s assistance. When you do, your reward will be great and you will be reflecting your adoption by God. If you decide to help, a few people will take advantage of your kindness (just as some take advantage of God’s) but others will be helped and glorify our father in heaven.